It’s been 4 months since my last update. Between a website and theme that was falling apart and the holiday’s, I elected to focus on building the plane instead of doing any updates. My goal here is mainly to summarize deviations and other issues I found while building, and I think going forward that is what I’m going to be focusing on with this blog. After screwing up the spar, I got a new spar from Vans and worked through the Horizontal Stabilizer. Two things to note here. Count your rivets. You’re going to be depleting 1 or 2 bags of rivets here. If you messed up or dropped your rivets anytime in the past, now would be the time to count your rivets and order more if you need them. I had to order more LP4-3’s and some AD3’s. I ran into issues riveting this section and I did a search on VAF and builder websites but I didn’t see anyone else specifically address this section so I’m assuming this may be a unique problem due to my circumstances, but I want to document what I did in case anyone in the future runs into this issue. Problem: It’s a PITA to rivet the 40 rivets between the middle HS-905 nose ribs and the skins. Lots of rivets got drilled out and holes were enlarged on the middle nose ribs. I’m short. 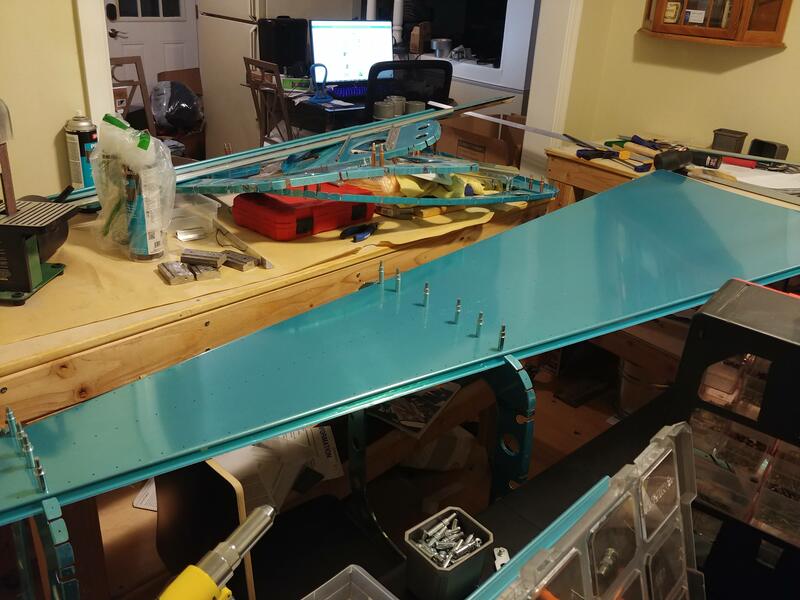 With an EAA-1000 table and the cradle, I need to stand on the tip of my toes AND tip the horizontal stabilizer to even reach some of the holes at the bottom. I used a shortcut and used nylon straps instead of the plywood that Vans calls out. While this saves a bit of time for those of us that don’t have wood working tools handy, it also means that the HS is free to move about in its cradle. I could not scrounge up any helpers. Being young, single, and living in a rural area that you recently moved to will do that to you. I only have two hands and could not locate more, see 3. My assumption at this point is that the biggest factor is the nylon straps. I’ve seen other builders use this as it allows you to maneuver the HS around while still in it’s cradle so you can get to stuff, but when you are riveting the nose ribs in essence you need one hand to hold the rivet gun, another hand to hold the bucking bar and one more to hold the HS in place. Allowing it to slip towards you means the rivet slips out. It may potentially not be an issue if you are tall enough so that your hand can get all the way to the leading edge of the HS without tipping the horizontal stabilizer towards you. It will also potentially not be an issue if you followed the plans and built rigid cradles. All of this would be downright easy if you have another person helping you. Tape. This should really be a given at this point but I didn’t realize how much help this would be until rib #2. Tape the rivets, this frees up a hand and prevents it from slipping out. Unfortunately tape doesn’t help shortness, but after I taped the rivets, I only had to use solution #2 maybe 3 or 4 times. Blind rivets. I talked to Vans Support to see if I’m just missing something huge, and they basically said everything I did was correct, however if I wanted to substitute blind rivets, MK-319-BS blind rivets are acceptable. I swapped in one of these if any of the rivets were particularly annoying. Mostly the first ones on the leading edge. The downside per Van’s is they are not as pretty and they are a bit heavier. Six pack of beer. Apparently this can summon extra hands. I did not have beer handy, which may be the reason for my predicament. A quick photo showing my setup. You can see how the nylon straps allow a substantial amount of movement to either side. Not much to say here. Finished them, leaving the trib tabs for now because I oversqueezed them. Fun. Waiting for the replacement skin to ship from Vans. This is fairly new actually, started this part a few days ago. I’m renovating the other 3/4s of the house, so I took over the dining room. 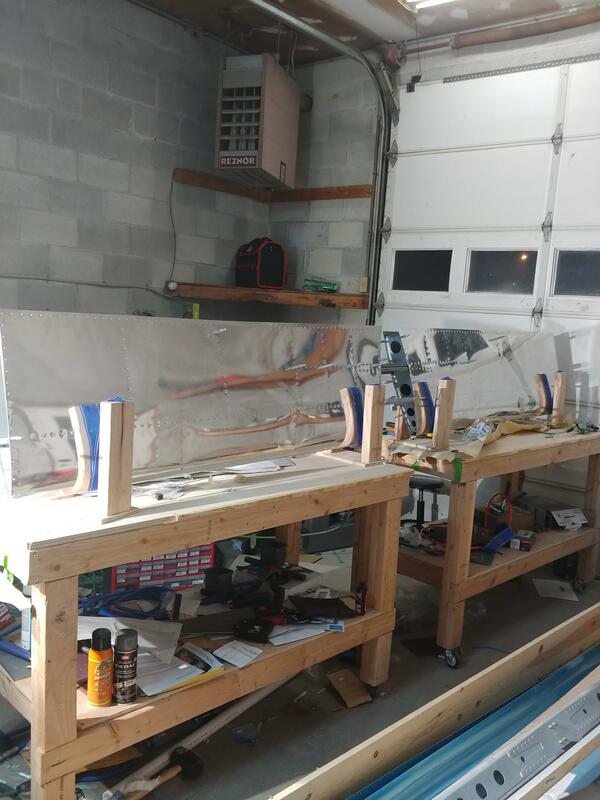 Put away the VS… …high on a shelf, started on the rudder!